Multiple filming session of Luna FLare from Soulfire including fans, palms, fire dancing, fire tracing and eating, poi and lots more awesome stuff! A Soulfire Studios production www.soulfirestudios.com.au. Song by The Crystal Method – Roll it Up. Fire performance is a group of performance arts or disciplines that involve manipulation of objects on fire. Typically these objects have one or more wraps of wick, which are soaked in fuel and ignited. Fire performance includes skills which are based on juggling, baton twirling and poi swinging and other forms of object manipulation. It also includes skills such as fire breathing, fire eating and body burning; sometimes called fakir skills. Fire performance has various styles of performance including fire dancing; the use of fire as a finale skill in an otherwise non-fire performance; and the use of fire skills as ‘dangerous’ stunts. Performances can be done as choreographed routines to music (this type being related to dance or rhythmic gymnastics); as freestyle (performed to music or not) performances; or performed with vocal interaction with the audience. Fire performance, or at least some of the skills that form part of it, has been a traditional part of cultures from around the world. Fire performance is a very dangerous performance art, and fire safety precautions should always be taken. Fire performance using different techniques is a part of the historic culture of some areas of the world. The oldest practice of fire performance is Samoa known as Siva Afi and fire knife. The fire knife dance has its roots in the ancient Samoan exhibition called “ailao” – the flashy demonstration of a Samoan warrior’s battle prowess through artful twirling, throwing and catching, and dancing with a war club while on fire. The ‘ailao could be performed with any war club and some colonial accounts confirm that women also performed ‘ailao at the head of ceremonial processions, especially daughters of high chiefs. During night dances torches were often twirled and swung about by dancers, although a warclub was the usual implement used for ‘ailao. Ancient Aztecs performed a fire dance dedicated to Xiuhtecuhtli, the god of fire. The Aztec fire dance is performed today for tourists in Mexico. In Bali, the Angel Dance and the Fire Dance, regularly performed for tourists, have origins in ancient rituals. Both the Angel Dance and the Fire Dance originated in a trance ritual called the sanghyang, a ritual dance “performed to ward off witches at the time of an epidemic.” Also known as the “horse dance” men perform the dance by holding rods representing horses, while leaping around burning coconut husks, and walking through the flames. French Polynesia, Antigua, Cuba and Saint Lucia are other locations where fire dances are recreated for tourists. The Siddha Jats of the Thar Desert in India perform traditional fire dances as part of the Spring festival. Fire dancing is performed to music played on drums and the behr. There are variations of the fire dancing; men often perform a dance that involves walking on hot coals, while women perform a dance while balancing flaming tin pots on their heads. Today this ritual is often performed for tourists. A fire dancer (breather) performing for tourists in Antigua in the Caribbean. Since the mid-1990s fire performance has grown in popularity. This growth has occurred both in the hobby and professional areas of the skill. Fire skills have become widespread at raves, nightclubs, beach parties, and music festivals. The Burning Man festival has also attributed to the growth and awareness of fire performance with its fire-oriented art. Fire performance has become increasingly popular as entertainment at corporate events, street festivals, celebration events and as a precursor to firework displays. The increase in availability of fire props and the growth in fire performance has contributed to an increase in the variety of way that fire skills are performed. Standard modern shows: These usually include performers in tight and perhaps even risqué costumes with face paint, performing with fire spinning tools. Such shows often include fire breathing as well. 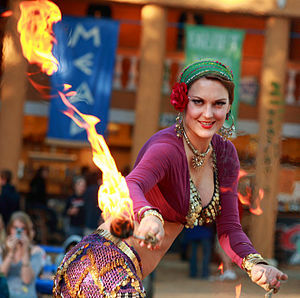 Fire and belly dance: Such shows are a fusion of Middle Eastern belly dancing (raqs sharqi) and combine elements of fire dancing and belly dancing. Often the dancers use palm torches and fire swords made to resemble scimitars. The Dancing Fire dance company was the first to fuse fire and belly dance. Other performance variations continue to emerge as fire dancing becomes more widespread and commonplace. Cirque du Soleil incorporated contemporary fire dance techniques for the first time in its Zaia production in Macau (2008—2012). Previous Cirque du Soleil shows Alegria and O relied on the skills of traditional fire knife artists for fire performances. 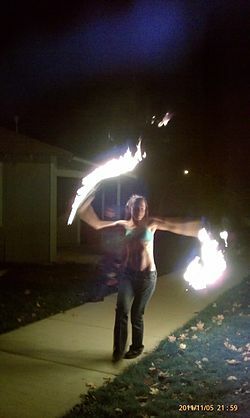 Recognition of contemporary fire dance and modern prop techniques has previously been very limited in the professional circus community. Dan Miethke worked as lead fire artist and fire coach in Zaia.